So I set about looking for something larger for it to live in but I couldn't find anything I loved. I also felt I didn't want something that meant it would have to stand on a window sill as, for one thing, our window sills are pretty full of plants as it is, and for another, we have a cat who's favourite pastime is pushing things off tables and shelves and watching them hit the floor! 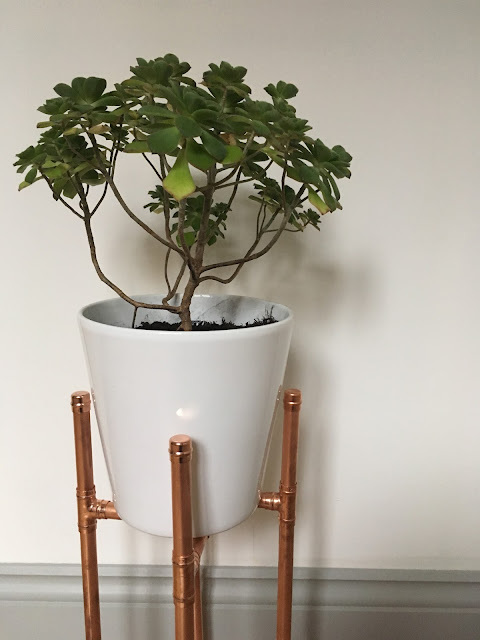 I bought all the copper bits and bobs from Homebase, along with a 2 meter length of copper pipe, and used 2 part epoxy resin to attach everything together. Definitely don't mix too much of this at once as it cures really quickly and it smells nasty so you'll want all the windows open! 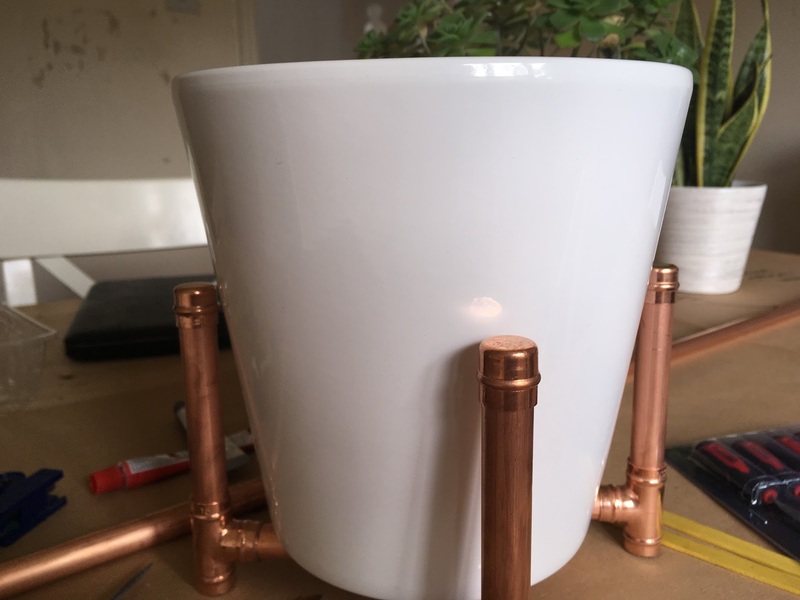 My pot is slightly smaller in diameter than the one Deborah used in her tutorial, so I changed the measurements for the base part of the stand to make it smaller too. 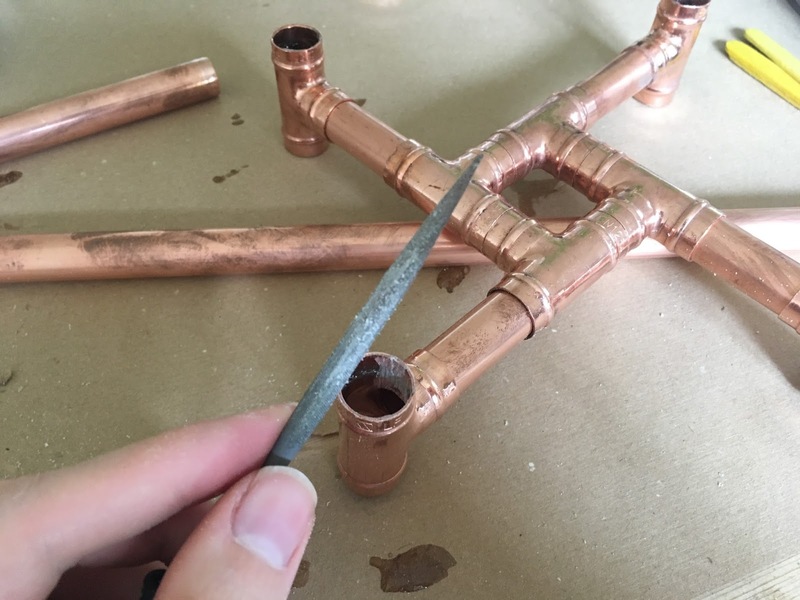 This meant that the T-shaped fittings ending up sitting directly next to one another with a small length of pipe glued inside. 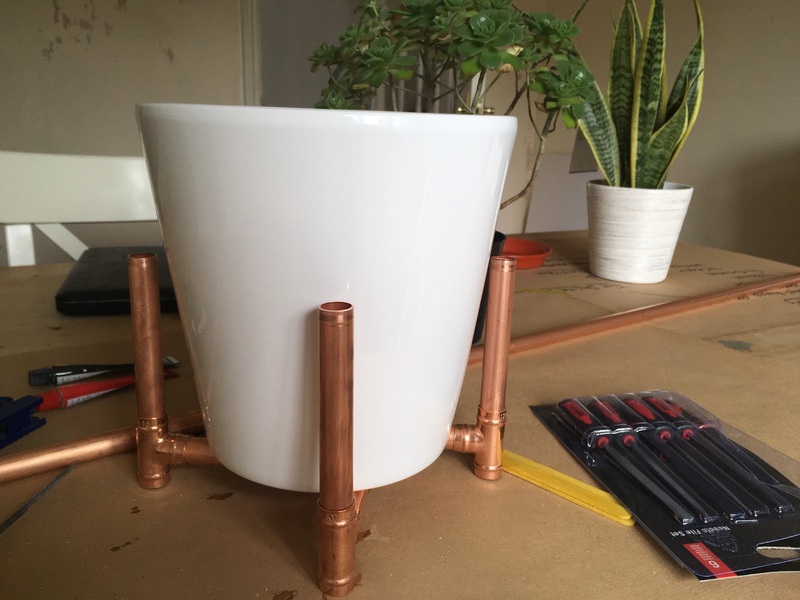 This is therefore the smallest stand you could make with these fittings, but it would be really simple to increase the measurements to accommodate a larger pot. 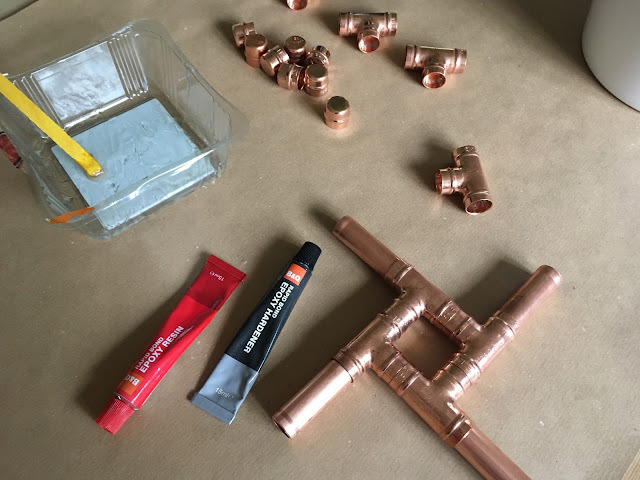 Here comes the mistake: When I glued the second set of t-shaped fittings onto the four corners of the base, I got a bit carried away with making sure they were sitting level and didn't pay attention to where the glue was running. 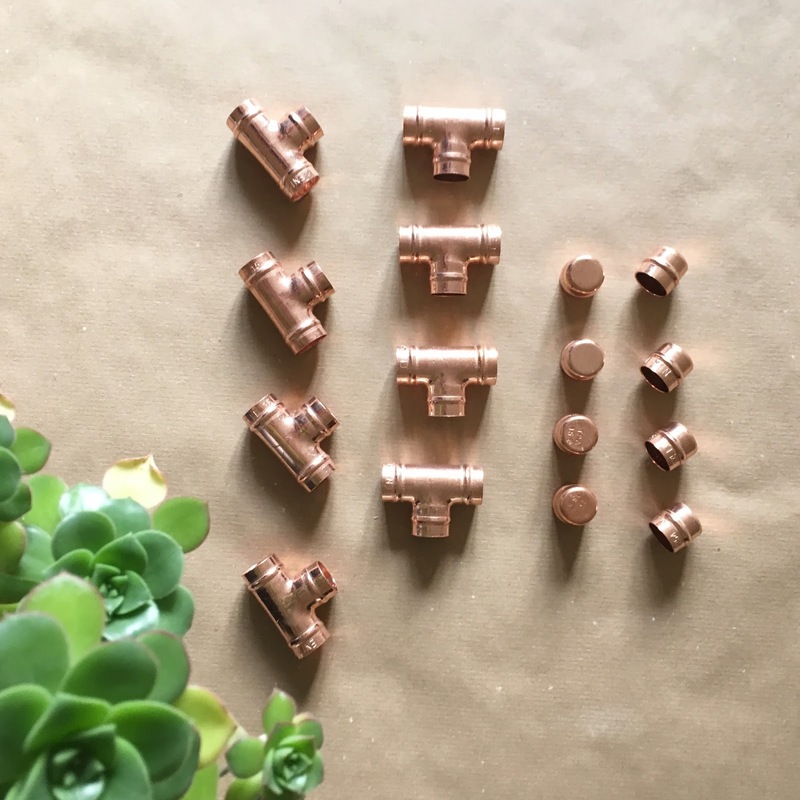 It therefore set inside the fittings making it impossible to push in the legs. So, I spent a good hour filing it down which made a lot of dust and really wouldn't have been necessary if I'd been a bit more careful. To decide how long to make the top part of the legs, I sat the pot on the base and cut the pipe so there would be just enough room to slide the pot in to the stand. Remember if you do it like this to take the caps into account too. After that it was just a case of attaching the legs. 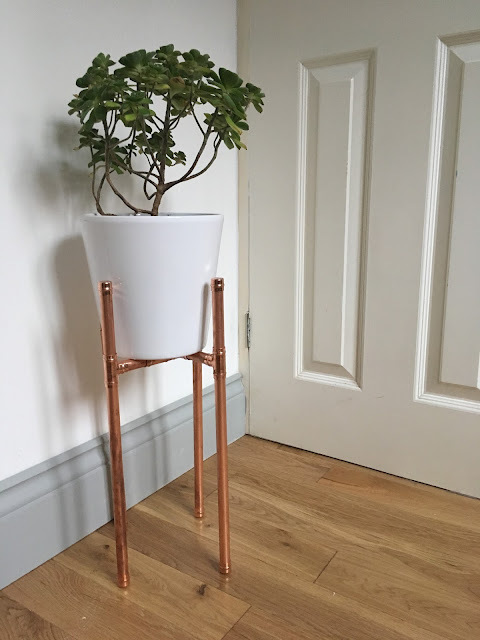 I wanted a slightly taller plant stand than Deborah made, so I simply cut the copper pipe I had left into 4 equal lengths. When I came to put the caps on, I noticed it wasn't sitting quite level on the floor, so one of my copper caps has a couple of tiny circles of paper inside it to level things out (you know - like when the waitress shoves some napkins under one leg of your table in a restaurant) I also added some small pieces of self adhesive felt so the feet won't scratch our new oak floor. This is how our hall way currently looks. 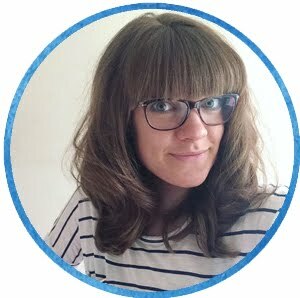 When we moved in it had beige walls and very questionable red carpet (and I think the woodwork was white once upon a time - ew!) We're nearly finished, just the door frames to paint grey and the doors to change, plus little bits and bobs like light fittings and curtains to hang. We may leave the doors as they are for the time being and change them all in one go once we've finished upstairs too - it's lovely living in a big house, but decorating does end up being far more expensive and time consuming. 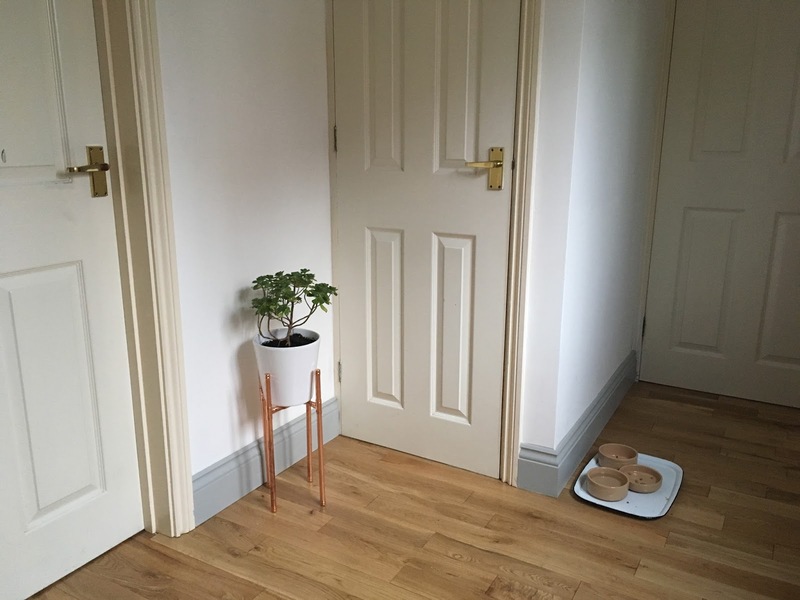 Finally though, with little touches like this, it's really starting to feel like our home now!